The health care bill is two inches thick, and with the stroke of his pen, the governor turned the legislation into law. It creates a consumer marketplace Exchange where individuals, and businesses with fewer than 50 employees, will be required to buy their policies beginning in 2014. Several hundred million dollars in federal subsidies will be available to make the policies more affordable. Shumlin said the bill is a major component of his overall economic development strategy. 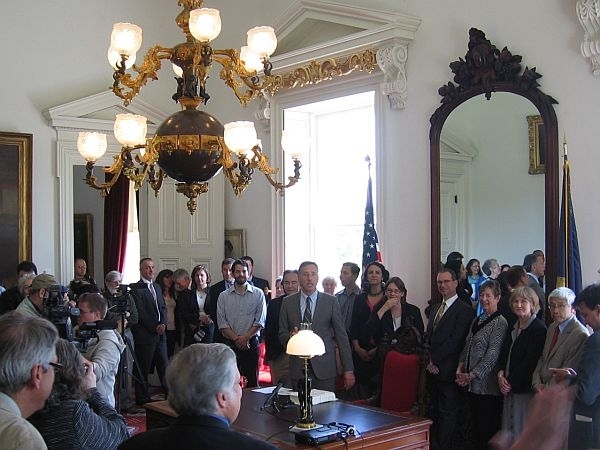 "The biggest challenge that we face for growing jobs and economic opportunities in Vermont is to ensure that we have affordable universal health care," Shumlin said. Shumlin is encouraging many small businesses to drop their coverage in 2014 because their employees will be eligible for the federal subsidies and he says decoupling health care coverage from a person’s place of employment is a key step. "This bill will give us the federal subsidies that will make many small businesses in Vermont," Shumlin said. "Look at the numbers and often conclude that they and their employees will be better off by letting their employees go shop in the Exchange for health insurance." The Governor added, "that helps us move toward one single pool, one single pipeline for health insurance." In several weeks the U.S. Supreme Court is scheduled to rule on the constitutionality of President Obama’s health care law. Anya Rader Wallack is the chair of the Green Mountain Care Board – a panel that oversees virtually every aspect of health care in Vermont. She said it will be a challenge to implement a single payer system if the Court strikes down the federal subsidies. "Clearly it’s harder to do if you don’t have that federal money but we can legally do it," said Rader Wallack. "It just means that you have to raise a lot more revenue or cut costs a lot more at the state level if you don’t have that infusion of federal cash." Rader Wallack said one of her chief goals over the next 18 months is to find ways to cut health care costs. "A lot of the waste in our system is actually in unnecessary hospitalizations for people who have conditions that if they were treated right they wouldn’t be admitted to the hospital nearly as much and be readmitted as a result of not having the primary care follow up," she said. The U.S. Supreme Court is expected to rule on the President’s health care law by the end of June.